Living at Ballin Temple is a real escape. We offer accommodation in traditional cottages refurbished with modern conveniences, like power and plumbing. The water comes from artesian wells, the air is fresh and the birds and breeze are the sounds that you hear. Mary Anne's Cottage - Where we fist lived when we came home. A double bedroom, a single bedroom and a bathroom upstairs. Downstairs is the kitchen with wood burning stove (and electric cooker) and living room with a small open fire. The covered yard behind leads to a small garden. It shares a utility shed with laundry facilities with Paddy's Cottage. Views are spectacular. 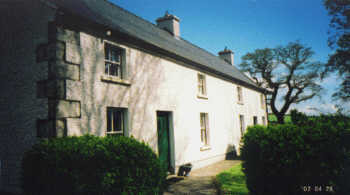 Paddy's Cottage - Was used as a pig pen until it was completely rejuvenated by Jim Bolger and his team in the late 1990s. It has a double bedroom, a single bedroom and a bathroom upstairs. Downstairs is the kitchen and living room with a small open fire. A covered yard behind offers a protected area for children. It shares a utility shed with laundry facilities with Mary Anne's Cottage. Views are spectacular. The Shed - Had no roof until it was renovated in 2008. Inside its open plan design offers a double bedroom ensuit upstairs leading to a large balcony. Downstairs is the living room and kitchen between which is a wood burning Rayburn stove. It shares a garden lawn with The Lodge. The Lodge - Was rebuilt from a derelict farmhouse in 2003. It was designed with flexibility to be a home or two cottages or fishing lodge. It offers six double bedrooms (four of which are ensuite). Dowstairs is living room, kitchen, dining room, study and utility room with two was rooms. Because The Lodge is a modern building we put in central heating without compromising the design. The Caravan - A small caravan that sleeps two. It is situated on the edge of a field which has been gradually replanted with trees. It is used by interns and visitors in the summer.